Phan Thiet (Phan Thiết) is a city located in Binh Thuan (Bình Thuận) province, on National Highway 1A, about 183km away to the northeast from Ho Chi Minh (Hồ Chí Minh) City. 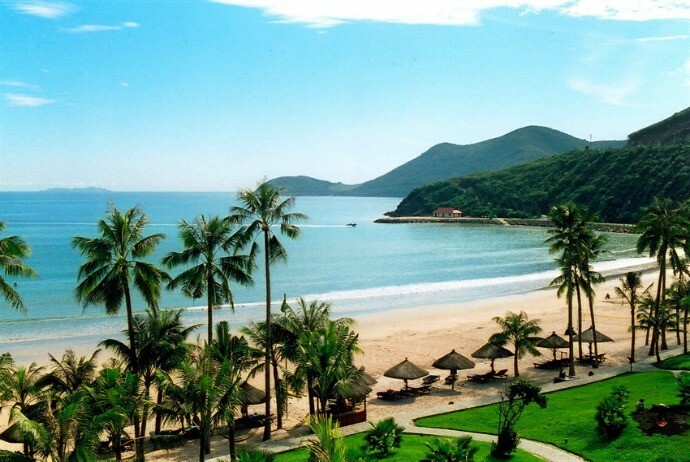 Phan Thiet has long been a famous tourist destination in Vietnam (Việt Nam) with the white sandy beaches and curved coconut trees. 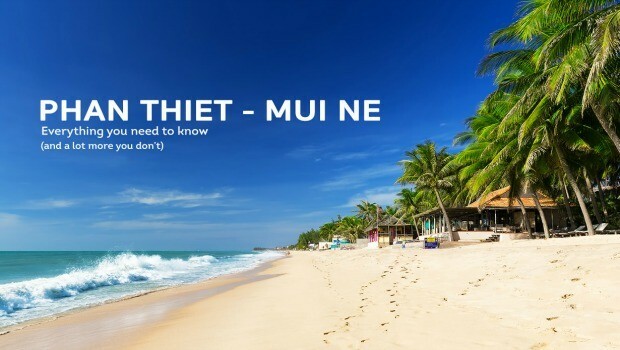 Not only does Phan Thiet – Mui Ne have beautiful natural sceneries, this area is also an appealing cultural tourism destination with diverse communities of Chinese, Cham (Chăm). 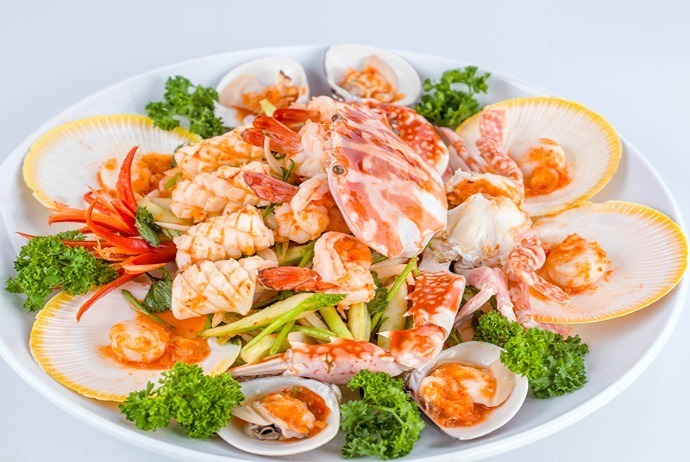 Traveling Phan Thiet, you will not only visit, go sightseeing, but also enjoy many delicious dishes made from fresh seafood. You can travel Phan Thiet in all months of the year with the windy, sunny and less stormy climate. From January to December, it is cooler than in the other months of the year. 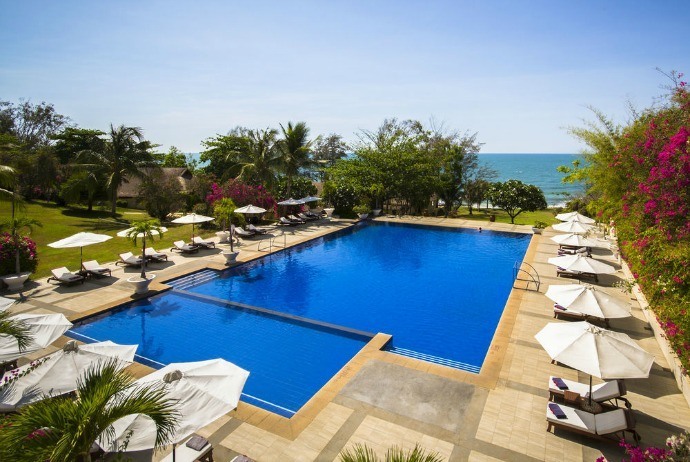 April and May are the hottest months, with the temperature reaching up to 29 ° C. The most appropriate time to visit Phan Thiet is June and July. Time: 5 am, departing from Mien Dong (Miền Đông) bus station or De Tham (Đề Thám) Street, district 1. Fares: ranges from 90,000 – 130,000 VND depending on the brand. 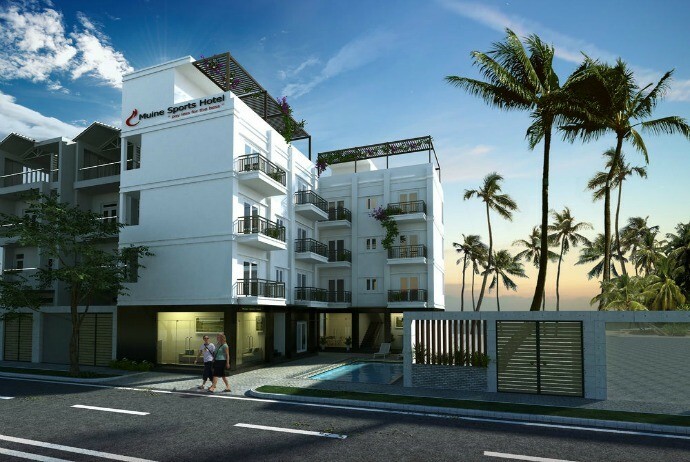 Phuong Trang (Phương Trang): Phone numbers: +84 Address: 276 De Tham (Đề Thám) street, District 1, Phan Thiet city. Sinh café: Phone numbers: +84 38376 833 – +84 38369 420. Address: no 246-248 De Tham, district 1. – Normal train: prices from 110,000 VND /ticket above, sign SPT (departing in the morning) or PT4 (departing in the evening or weekend). Buy ticket at Saigon station – No.01 Nguyen Thong (Nguyễn Thông) street, District 3, Phan Thiet. – High quality train: Golden Train, prices from 160,000 VND / ticket above, departing in the morning. Tel: +848.35261685 – +848.35262724. 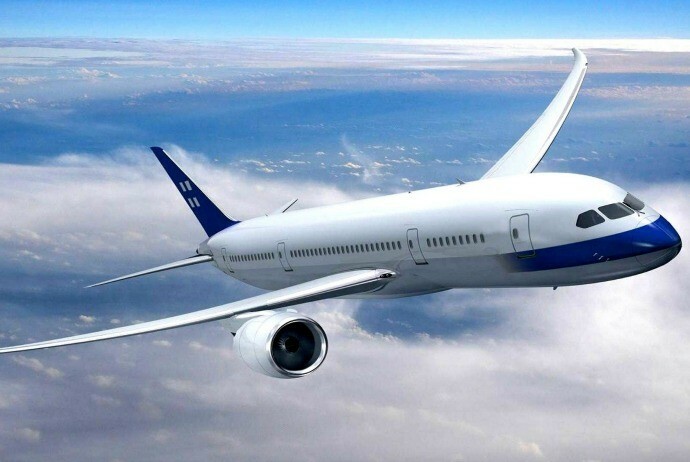 – Airplane is the most convenient means to get to Phan Thiet for visitors from Hanoi: Departure from Hanoi to HCMC, then go by bus or train to get to Phan Thiet. Another way is that you fly from Hanoi (Hà Nội) to Nha Trang, and then continue to go to Phan Thiet. This is the school by patriotic scholars founding in 1907 in response to the Duy Tan (Duy Tân) campaign in Trung Ky. The school school also marks the time when President Ho Chi Minh (Hồ Chí Minh) stopped to teaching before going to Saigon (Sài Gòn). Today, Duc Thanh School has still retained almost intact dated back nearly a century ago. On the Ngu Ong (Ngư Ông) road, Duc Thang (ĐứcThắng) Ward, Phan Thiet (Phan Thiết) city, there is a temple worshipping the god Nam Hai (Nam Hải) – ie Ca Ong (Cá Ông) (whale). The skeleton of the whale kept the palace Van Thuy Tu is 22m in length, weighs 65 tons, and is considered the largest one in Vietnam and Southeast Asia. Every year, the ceremonies are hold at the lunar day: 20/2, 20/4, 20/6, 20/7 and 23/8. In the course of the ritual, there are activities such as “Bội” singing, racing boats, etc. On the way to discover Mui Ne, you will be curious about Lau Ong Hoang because it is associated with the poet Han Mac Tu. Lau Ong hoang used to be the rendezvous between Han Mac Tu (Hàn Mặc Tử) and Mong Cam (Mộng Cầm) – lover of the poet. The poet Han Mac Tu has many poems about this place with charming scenery. Poshanu tower is collated in the hilltop of Ba Nai (Bà Nài), Phu Hai (Phú Hải) Ward, about 7 km to the northeast from to the center of Phan Thiet city. Poshanu Cham Tower is a remnant relic group of the ancient Kingdom of Champa. The tower has Hoa Lai (Hoà Lai) style architecture – one of the ancient art styles of Champa (Chăm Pa). Despite of the small and medium-sized style, this establishment distilled the essence of technical architecture and decorative arts of the ancient Cham people, creating majesty and mystery. 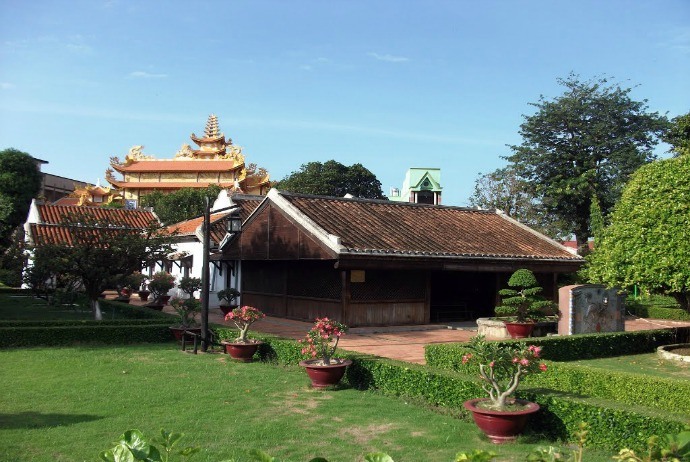 Ho Chi Minh Museum in Binh Thuan (Bình Thuận) was established on 19.05.1986. This is the place where President Ho Chi Minh lived and taught in before he went to Saigon to save the country. Rang Beach is the most beautiful beach of Phan Thiet city. Rang Beach is about 15 km to the north, under the dense coconut looking similar to a beautiful coconut grove. In summer, Rang beach is crowded by tourists who swim and enjoy great seafood. About less than 1km away from Mui Ne, Ghenh island, also known as Lao island (hòn Lao), is still pristine. To reach this island, you can take the shuttle service from the hotel or rent a fisherman’s boat for approximately VND200,000 / boat of 10 people. After 10 minutes of sailing, you will set your foot on the island. The first impression is clear sea water, you could see beautiful coral reefs under the water, the big and small rocks piled up. To go sightseeing Lao island, you should go in the afternoon as at that time, you can see sunset covered gradually on the sea. Early morning is the most suitable time for the amateur anglers. Bau Trang – Bau sen is about 18km away from Rom island. This is two natural freshwater lakes located between the vast white sand dunes. Bau Trang also has the other name of Bau Ong (Bàu Ông). Coming here in the summer, you will be able to contemplate the blooming lotus flowers interspersed between white sand dunes. Bau Sen, also known as Bau Ba (Bàu Bà), has a vast lake, deep blue water surrounded by the beautiful white sand dunes with delicate pure white color. Tien stream, called as “Elysium” by tourists, is a small stream located next to Rom (Rơm) Island, this is the walking spring with the beautiful sandy valley. Next to the stream, there are natural stone hills with red and white color. Due to the erosion of time, those stalactites with strange shapes were created naturally. Located about 3km to the north of Mui Ne town, Mui Ne town is another destination tourists should not skip when visiting Phan Thiet. Right at the entrance of the village, you could witness hundreds of fishing boats with different colors moored on the water. Not far from the port, there is a small colorful market with peaceful beauty of surrounded coconut trees. Walk along the beach covered with sea shells, you will see how local fishermen classify the fish caught. 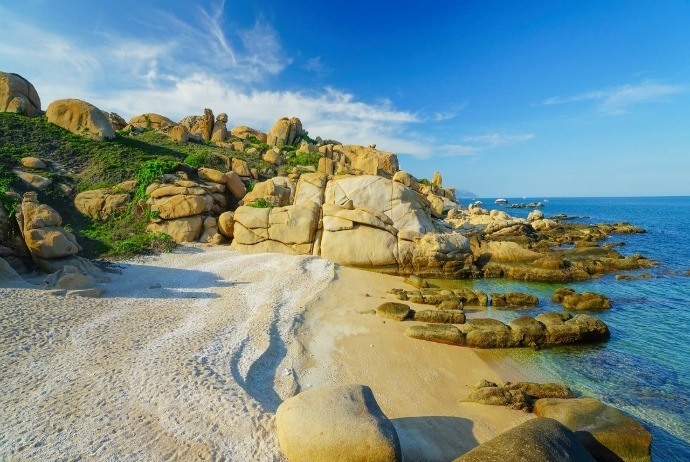 Ba Island is a small island located off the coast of Lagi, Ham Tan (Hàm Tân) district about 2km to the east, and about 70km from Phan Thiet to the southeast. Ba Island has a shape of the giant turtle raising its head above the waves. 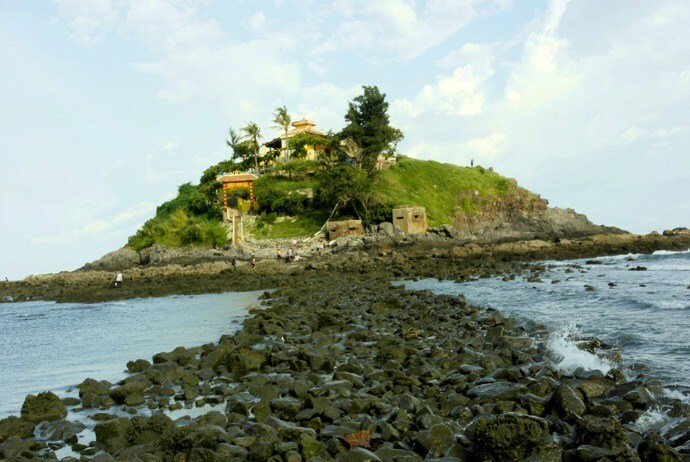 On this island, there is the temple dedicated for Ya Ana Goddess – the sacred deities of the ancient Champa Kingdom. Ke Ga Lighthouse majestically stands in the middle of pristine beach with clear water on the Ke Ga island. To visit Ke Ga lighthouse, you can contact the resort to charter or rent the ship, basket, or boat of locals. 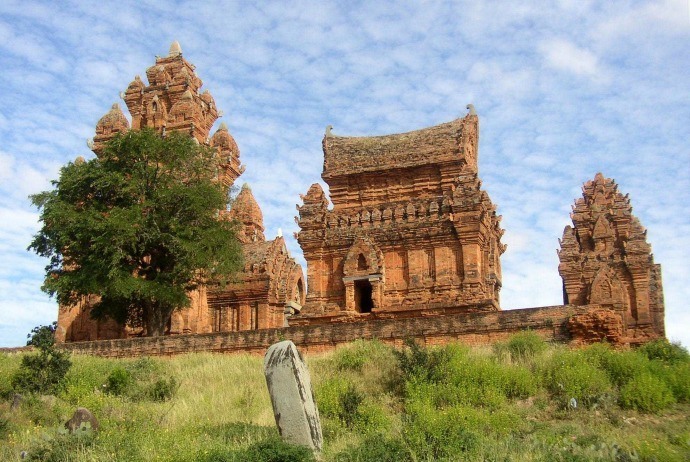 Ta Cu Mountain tourist area is located near the National Highway 1A, in the town of Thuan Nam (Ham Thuan Nam (Hàm Thuận Nam)), about 30km to the south of Phan Thiet. If you love adventure and have good health, you can conquer the peak after climbing over 1000 stairs. The 2nd faster way is to take the cable car to the summit, after just 15 minutes. On top of the mountain, there are two famous temples, which are Linh Son Truong Tho (Linh Sơn Trường Thọ) and Long Doan (Long Đoàn) Pagoda. Here, the most famous is the statue of Sakyamuni with the lying posture and 49 meters of length. This is the biggest lying Buddha statue in Southeast Asia. 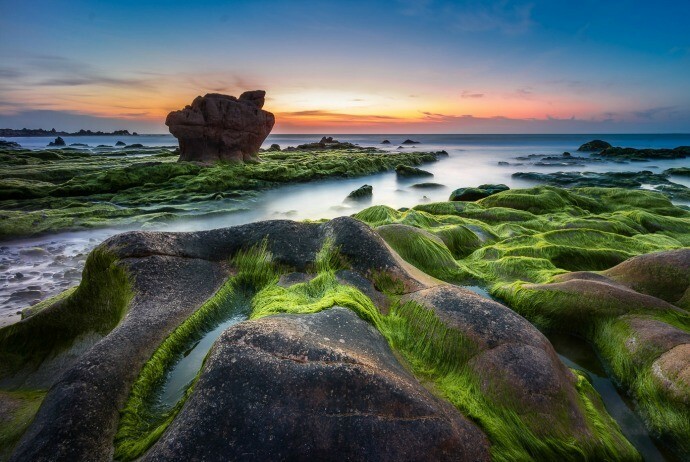 Stretching on a part of the beach of Binh Thanh (Bình Thạnh) commune, Tuy Phong district, there is a 7-color rock expanse located in Co Thach tourism zone. The stones have many sizes and shapes. 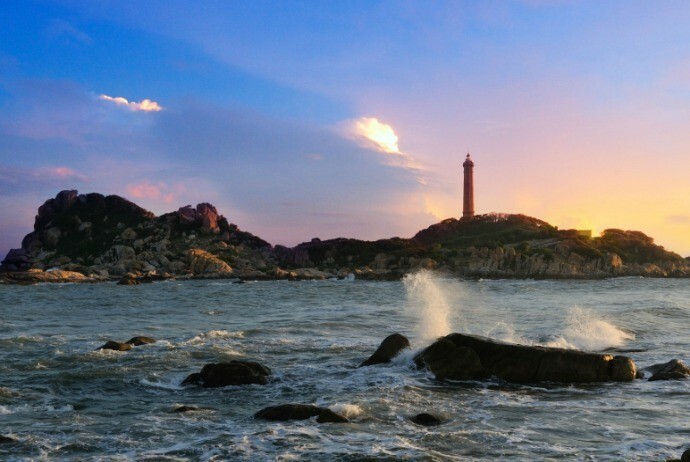 The reef is confirmed as “the most colorful rock expanse in Vietnam” by Vietbook. In the middle of a vast sand zone, the presence of the rocks is an emphasizing point dragging more and more tourists to enjoy. Also known as Co Thach Tu (Cổ Thạch Tự), Hang pagoda was built in the first half of the 19th century, located in a cave on Co Thach Hill, at the height of 64m, in Binh Thanh (Bình Thạnh) commune. The pagoda was built in the large cave founded by Zen Master in the mid of 19th century. Tourists can visit both this ancient pagoda and the 7-color rock expanse above at a time. Cu Lao Cau belonged to Phuoc The (Phước Thể) commune, Tuy Phong district, shows up as a large warship, surrounded by tens of thousands of stone blocks with different colors and shapes. This is a deserted island, located about 9km from the coast, by It takes about 1 hour and 30 minutes by ship to go from the mainland to the island. On the island, there are thousands of rocks with very unique shapes, alternating with the velvety green lawns. It is planned as the reservation area of marine life and also an attractive marine eco-tourism spot. 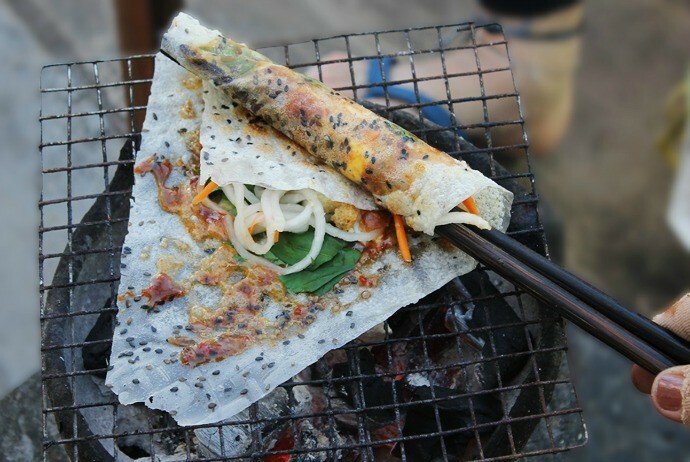 This item is sold along with the grilled shrimp paste rice paper “bánh tráng mắm ruốc” at the roadside shops. The composition is very simple: rice paper + shrimp paste + cracklings greaves + quail eggs. Everything will be rolled, bringing a very delicious and attractive taste. Address: This dish is usually sold in the evening. Rice spaghetti is a simple, nutritious dish. You can use the bread to dip into the soup of rice spaghetti. There are different forms of rice spaghetti, such as “Banh canh cha ca (Bánh canh chả cá)”, “banh canh cha hap (bánh canh chả hấp)”. Particularly, this dish in Phan Thiet is a little bit sweet, so you may not get familiar with at first, but let’s enjoy for once! In addition to rice spaghetti, you can also enjoy dish of bread dipped into “xiu mai (xíu mại)”. – Xíu rice spaghetti restaurant: Location: No. 1 HA Kim Dong (Kim Đồng) Street. Serving time: from 2pm to 10pm. 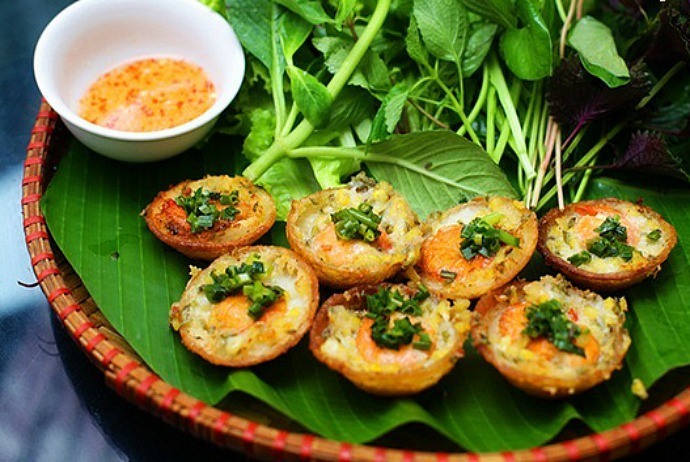 Salad (dish made from raw fish and vegetables) is considered a must-try dish in Phan Thiet. Fish salad is made from fresh fish served with assorted vegetables, noodles and a special sauce. – The restaurants around the embankment of Ca Ty (Cà Ty) river. This is a very typical dish of Phan Thiet, you should try at least one times to see the difference between Quang noodle in Quang region and in Phan Thiet. Address 1: 129 Tran Phu (Trần Phú) Street. This place sells both morning and evening. Address 2: Noodle eatery near the Phan Boi Chau (Phan Bội Châu) school. It is not too difficult to find an eatery selling “banh can (Bánh căn)” on the streets of Phan Thiet, this dish is often sold in the evening, with a very affordable price. 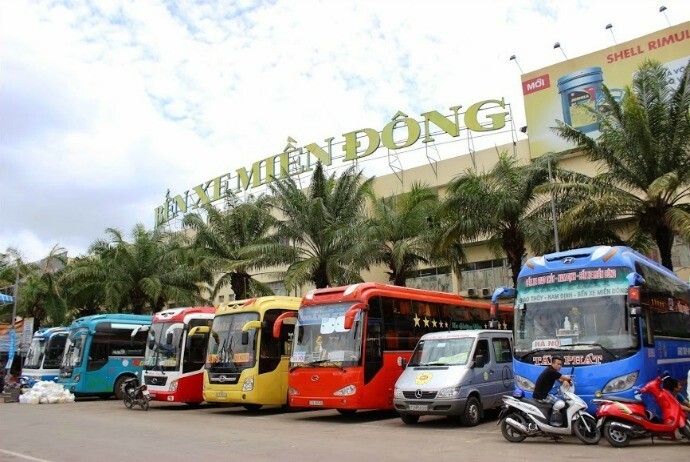 – From Le Hong Phong (Lê Hồng Phong) Bridge toward Phan Thiet market, you go straight down and see the glasses store named Eden, in the evening, here you will see a lot of sidewalk restaurants serving delicious “banh can (bánh căn)”. – No.08 Hai Thuong(Hải Thượng) street, with polite and nice space. This is the special cake of Phan Thiet, with very attractive flavors and colors, and can be stored for a long time. You can purchase this item in Phan Thiet Market or specialty stores along Ca Ty (Cà Ty) River and in Mui Ne (Mũi Né). 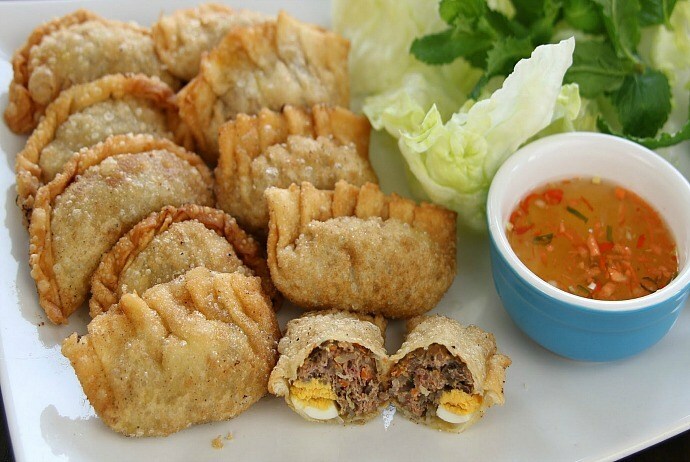 This dish rolls rice paper will be as delicious as “goi ca mai (gỏi cá mai)”, if you visit Phan Thiet without enjoying this dish, it will be a big pity. Xuan Vang (Xuân Vàng) restaurant: located at Pham Van Dong (Phạm Văn Đồng) street and many other eateries located in the Mui Tau (Mũi Tàu) zone, close to Tran Hung Dao (Trần Hưng Đạo) bridge – Phan Thiet. Thu Ty (Thu Tỷ) restaurant, Tu Minh (Tư Minh) restaurant: also located in the Ca Ty (Cà Ty) zone, you should come here if you want to taste this dish at the late afternoon and evening. This is very popular dish, yet its taste is very charming. The dish is widely sold by street vendors at Doi Duong (Đồi Dương) beach, or you could enjoy the dish at the food zone in Phan Thiet Market. This dish is the favorite of students. Address: this dish is sold at the area around Health Department (Sở Y Tế) near Phan Thiet Railway station in the afternoon from 3pm to 7pm. There are also other dishes made from snails. When it comes to beef noodle, you may think of Hue (Huế) beef noodle, yet do you know that Phan Thiet also has its own beef noodle soup which is very delicious? With different taste in compared with Hue beef noodle, particularly the small noodles used; you will be able to taste one of the must-try dishes in Phan Thiet. This dish is loved by the youth when visiting Phan Thiet. – The grilled squid teeth restaurant on Nguyen Tat Thanh (Nguyễn Tất Thành) street (on the way to Doi Duong (Đồi Dương) beach). For many tourists visiting Mui Ne, dropping pot-au-feu is an impressive dish. This dish is made of opaque, “suot” fish, but the most delicious is still “mai fish (cá mai)” – one of the regional specialties of Phan Thiet, Binh Thuan (Bình Thuận). Enjoying this dish, you will explore more about the deep philosophical meaning of Vietnam cuisine, based on five wonderful elements of the ancient Vietnamese according to the ancient Buddhist theory: metal, wood, water, fire, and earth. “Dong” is considered as a delicacy of sand hills. 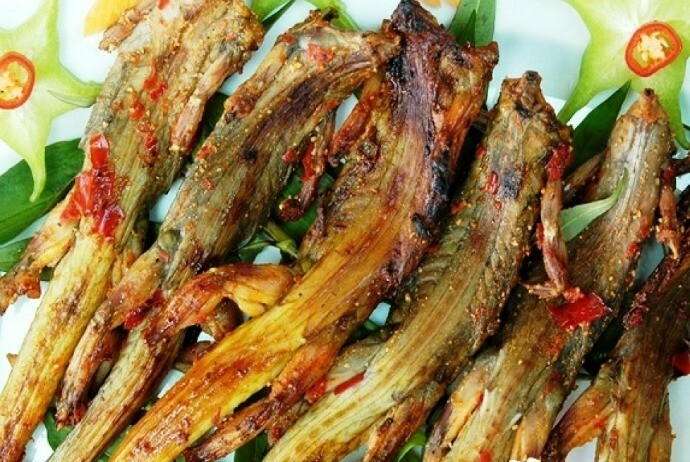 For those Phan Thiet people who are living far from home, Grill “Dong (Dông)” is dish that cannot be forgotten in their memories. 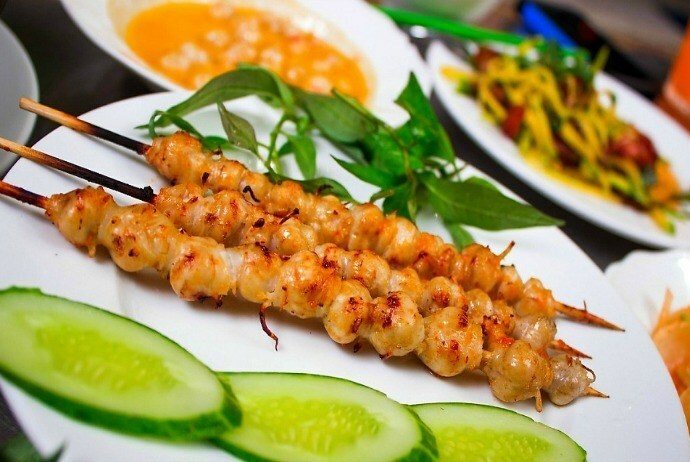 The taste and flavors of this dish make the different between grill “Dong” in Phan Thiet and in other places. Bo Hom fish has white meat rather similar to chicken mat but the fragrance is not similar to that of fish. Bo Hom (Bò Hòm) fish is best served with rice paper. This dish is sold in many eateries on Pham Van Dong (Phạm Văn Đồng) Street or restaurants in Mui Ne. With vast sand dunes, clear and poetic beaches, picturesque fishing villages in the sunset… Phan Thiet is the place attracting many tourists to explore by motorbikes. With about 200,000 VND of hiring a bike each day, tourists can freely explore all corners of the city. 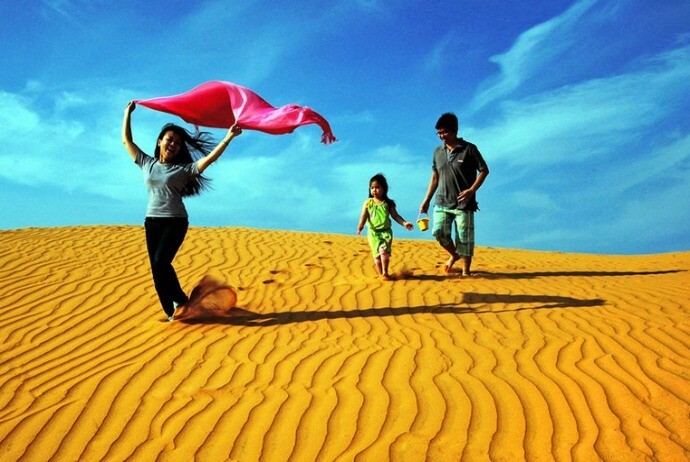 Located in Mui Ne (Mũi Né) Ward, “flying” sand hill (đồi cát bay) is always attractive for tourists. What is unique here is that whenever there are big winds, the sand dunes look very different from the previous shape and color also changes, sometimes yellow, white, gray, dark red… mixed together to create a beautiful natural picture. Sliding down the dunes gives tourists an exciting experience. With a plank, those adventurous travelers slide from the top down. The shouts mixed with laughter will bring to you the moments of relaxation. 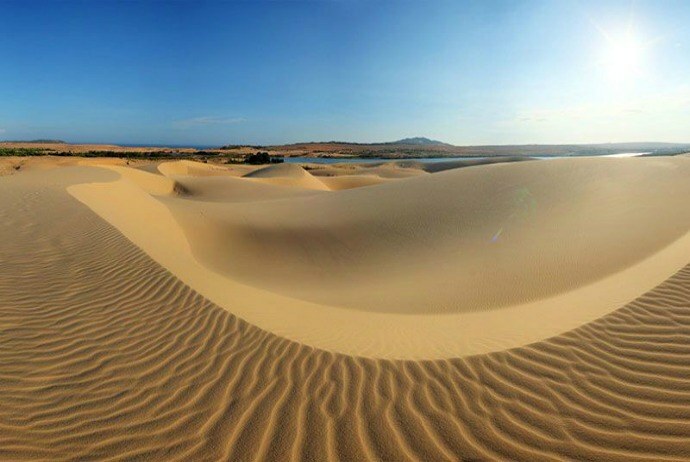 Phan Thiet is a perfect place for those who are looking for a quiet place to watch the sunrise or sunset on the golden sand dunes in a windy day. You can relax by listening to the sounds of flute kite on the sky or the sounds of sea waves patting, making the life slow down and all troubles seem to be dashed. There are many beaches in which you can comfortably play with the waves in Phan Thiet. However, what is more interesting is finding empty beaches that can allow you to freely enjoy a vast space with earth and sky, sea and do the things that you love. With the long coastline, always windy weather, Phan Thiet has become the ideal place for sports, especially kitesurfing. Using a dedicated kite, with a dedicated team of instructors, it is interesting that you can enjoy riding on the top of waves. 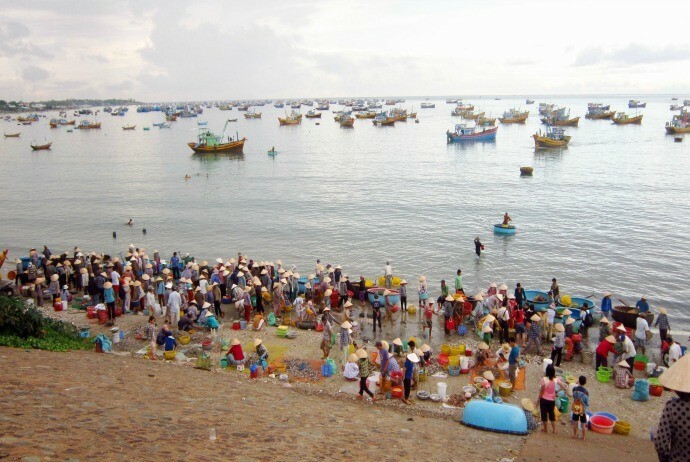 If you visit Phan Thiet, do not skip Bau Trang (Bàu Trắng), Bau Sen (Bàu Sen_. 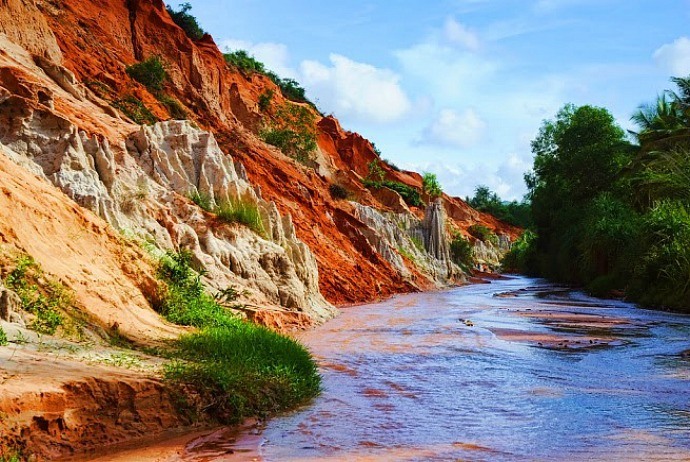 They are two natural freshwater lakes located in the middle of the vast white sand dunes, about 60km away from Phan Thiet city. During the lotus season, lotus at lakeside blooms up, creating garish colors for white sand dunes. You could rent a small boat to cruise on the lake, pick up lotus, go fishing and feel the poetic sense of the vast lake in the middle of white sand, watch beautiful sunset on the lake. Exploring and getting to know the lives of fishermen in the coastal fishing villages is also an interesting experience. Every morning, every night fishing boat ashore, everyone hurries to put the fish and seafood onto the coast, and crowdedly trade. The pictures of small fishing villages, sunrise falling on the sea or on the cliffs, or white sand dunes – all of them have become excellent places to take pictures. 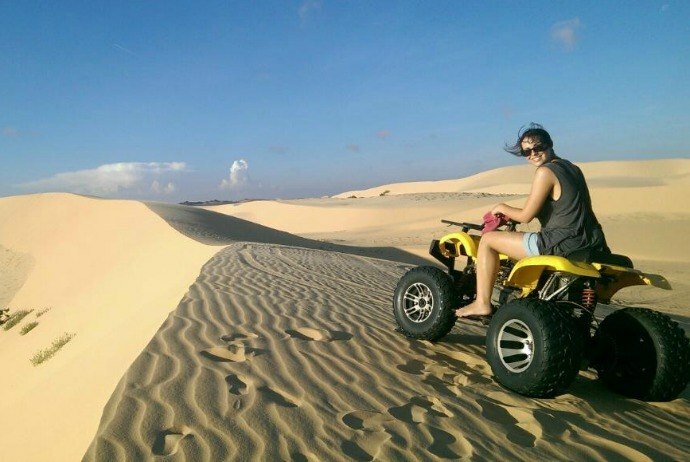 Mui Ne Sand Dunes is one of the ideal places to be many young people “check-in” when traveling to Phan Thiet. This is the pride of Phan Thiet people. It is the place inspiring and making many photographs gotten international awards. The name is derived from the reality that this sand dune has yellow as the main color. Due to this featured color, it creates an outstanding backdrop for the photos. Thus, those photos are always gorgeous and each frame has a different beauty. 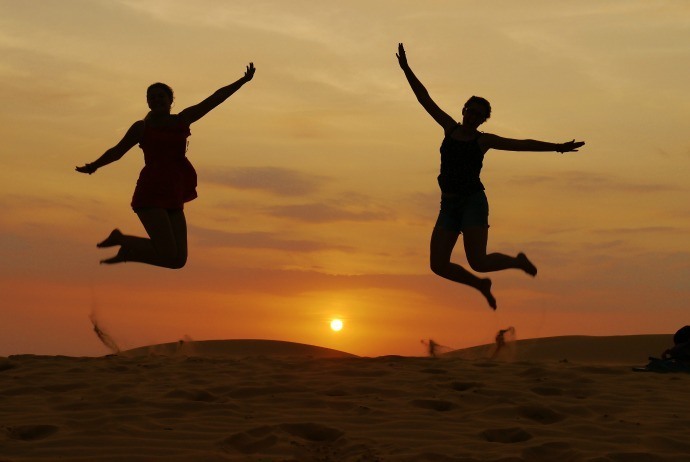 The most ideal time to take pictures in the sand dunes is in the early morning or late afternoon. Stretching over the sea with large and small stones, with many different shapes, particularly the rock with Mr.Dia shape looking at the mainland, this rock becomes a place attracting tourists to visit and take photos. The vast blue sea, cloud-alike waves, and soaring mountains go into the pictures in natural ways but not less sparkling and romantic. 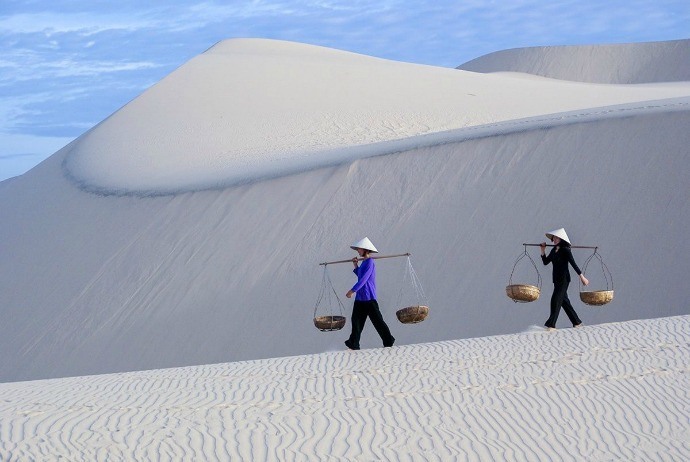 If the flying sand hills are famous for sparkling golden sand, Bau Trang impresses tourists with vast white sand dunes. In the middle, there is a freshwater lake located in the sand dunes creating a flawless picture of an oasis within a desert. In addition, this lake also has a lot of lotus, so if you visit right at the time of lotus blooming, you can have an extremely beautiful photo background. Despite of the far distance from the city center (about 50km), it is still a destination for many youngsters to choose for taking beautiful photos. Tien Stream is famous and attracts many domestic and foreign tourists due to its scenery which seems to be filled with romance and mystery. The landscape of Tien Stream has an unmistakable beauty: one side is sandy mountains with red and white colors intertwining, the other side is shrubs with luxuriant shady coconut trees. This is an ideal space for taking photographs and mingling with nature. This is considered as a “Sub-area” of Mui Ne (Mũi Né) with the beach of more than 17 km in length. It has stunning views which still bears the original features so you can freely creating impressive photos. You can come here in all seasons because each season brings a specific beauty of the island. In dry season, the fired grass with yellow color when looking back from afar is like a giant straw mound, therefore calling as Hon Rom.